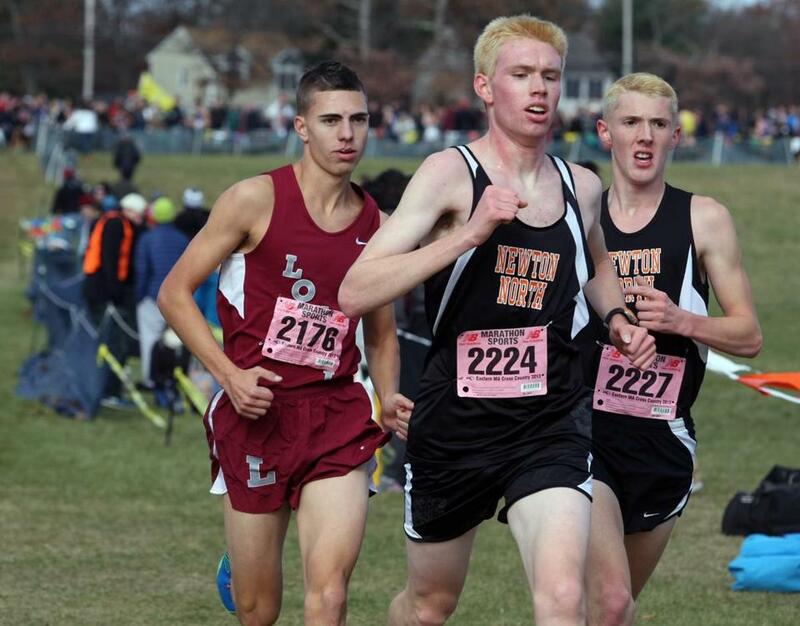 All-Scholastics Gabe Montague (middle) and Mike Schlichting (right) of Newton North tried to separate from All-Scholastic Johnny Abraham of Lowell during the Division 1 EMass race. Montague is the Division 1 All-State champion (14:27). He also took third at the Division 1 EMass meet the previous week. Montague was the Bay State Conference champion and an All-American after his medley relay team’s sixth-place finish at the New Balance Indoor Nationals. As Division 2 All-State champion (14:15), Carleo finished his season strong after setting a home course record earlier in the season (14:59) and placing first at the Division 2 Frank Kelley Invitational. Carleo was also second in the Division 5 EMass meet (15:28). Abraham’s second-place finish at the EMass Division 1 meet (15:32.4) helped Lowell win the team title, while his seventh-place finish in the Division 1 All-State meet(14:48) led Lowell to second place. He is the MVC Runner of the Year and he’ll attend UMass-Lowell next fall. As a sophomore, D’Anieri placed fifth in the Division 1 All-State championships (14:45), establishing himself as the youngest runner among the top 10 finishers. D’Anieri came in fifth at the Division 2 EMass meet (15:53) and is also an honor roll student. Deokar was the ISL MVP after setting a course record at St. George’s School in the New England Division 3 championships, and set an ISL course record at St. Mark’s School, along with other course records. He is a high-honors student and plays the saxophone. The fourth-place finisher at the Division 2 All-State championships (14:36), Enos also placed fourth in the Division 4 EMass meet (15:59). Enos broke his school record for his 15:48 finish at the McIntyre Twi-Light Invitational Meet. He is a South Coast Conference All-Star. Garmon placed second in the Division 2 EMass meet (15:38) and 11th at the Division 1 All-States (14:57). A Merrimack Valley Conference All-Conference runner, Garmon was first in the New Balance Nationals in the 4 x 800 meters and he hopes to continue running for a Division 1 college. The Division 1 All-State runner-up (14:37), Gonser also won the Division 3 EMass title (15:27) and placed first in the Division 1 Bob McIntyre Twilight cross-country meet. He is the two-time Hockomock champion and holds the Division 2 indoor track state title in the mile. In addition to holding the Division 4 EMass title in a course record time (15:08), Hogan placed second in the Division 2 race at All-States (14:21) and is the Middlesex League champion. He also won the McIntyre Twi-Light Division 2 meet. He’ll attend UMass-Lowell. Winner of the Division 2 EMass meet (15:33), Kerber finished third in the Division 1 All-State championships (14:43). He is also the Dual County League champion and holds the state title at 1000 meters in track. Kerber plans to run Division 1 track next fall in college. Kleinberg, a junior, was voted the MBIL MVP this season. In addition, he came in first place in the league championship race and set a Gann Academy course record. He also plays soccer and enjoys weightlifting and studying robotics in his free time. Mahoney placed third in the Division 5 EMass (15:39) and the Division 2 All-State meets (14:51). He is the record holder for Swampscott’s home course, and was the Northeastern Conference Cross Country Champion at Bradley Palmer State Park. Ranked No. 3 in his class, he’ll continue running in college. The Division 1 EMass champion (15:29), Schlichting also came in fourth in the Division 4 All-State meet (14:45). He is a Bay State Conference All-Star and finished second in the two mile at the New Balance Nationals outdoor track meet (9:19). He plans to continue running in college. Stafford placed second in the EMass Division 4 championship (15:24.1), and third in the Division 2 All-State meet (14:32), contributing to Pembroke’s team title in both races. Last year, he placed eighth at Nike Cross Regionals, qualifying for the 2012 Nike Cross Nationals. He’ll attend Northeastern. Valeri finished sixth in the Division 2 EMass meet (15:45.7) and third in the Division 4 All-State race (14:43), making it the third season he has played a role in Pembroke’s Division 2 All-State title. Valeri will attend the U.S. Military Academy at West Point next fall. The Division 5 EMass champion (15:27), Wyman was fifth in the Division 2 All-State meet (14:42) and set four course records this season. He is the South Coast Conference champion. Wyman is also an honor roll student and will run cross country and track at Brown. Almost a fixture on these pages, Collins has been both a track and cross-country coach of the year for the Globe during her time at Mansfield. This fall Mansfield won the Division 1 All-State title and also took first at the Division 2 EMass meet. With a third-place finish at the Division 2 state meet, Medfield had its best finish in Michael Kraemer’s 26 years of coaching at the Tri-Valley League school. Medfield also took second in the Division 4 meet and finished 8-1 in the dual meet season. Atlantic Coast — Dennis-Yarmouth: Keith Barnatchez. Falmouth: Oliver Newman, Sean Quinn. Marshfield: Kyle Grable, Kevin McManus, Matt Meehan, Russell Santos, Mike Tautiva. Nauset: Andrew Burke. Plymouth North: Nate Shannon. Plymouth South: Max Bassett. Sandwich: Jake Barry, Matt MacDonald, Ian McCartney. Bay State — Brookline: Emmanuel D’Agostino, Alex Peebles-Capin, Ben Pollak. Framingham: Mike McDonald. Needham: Adrian Amaya, John Benner, Tommy Kelley, Drew Khalaj. Newton North: Max Brandl, Jared Freedman, Gabe Montague, Mike Schlichting. Walpole: Pat Connell, Mike Van der Linden. Wellesley: Thomas D’Anieri, Ben Griswold, Danny Paladino. Weymouth: Sam Martin, Zach Prescott. Big Three — Brockton: Matthew Kerrigan, Chris McCaffrey, Stephen McCall, Dylan Rich. Durfee: Matthew Baker, Carter Whitty. New Bedford: Jason Vieira. Cape & Islands — Sturgis East: Cameron Henchy, Brian Kelsey. Sturgis West: Liam Furey, Andrew Morris, Alex Sheremet, John Snowman. Cape Ann — Hamilton-Wenham: Matt Gillis. Ipswich: Michael Riddle. Manchester Essex: Spencer Feuerbach, Cameron Holley. Masconomet: Daniel Cosgrove, Kyle Faddis. Newburyport: Nick Carleo, Joseph Molvar. Pentucket: Alex Demeule. Catholic Central — Archbishop Williams: Liam Rose. Arlington Catholic: Allen Judd, Mike Venditti. Austin Prep: Peter Blake. Bishop Fenwick: Eric Leohle. Cardinal Spellman: Conor Bergin, Ben Gordon, Matt MaCauley, Ben Williams. Lowell Catholic: Brian Peterson. Marian: Megan Bubello, Nick Seymour, Declan Walsh. Matignon: Matt White. Catholic Conference — BC High: Chris Breen, Robert Brook, Brian Djerf, Noel Feeney. Catholic Memorial: Corey Snow. St. John’s Prep: John Brennan, Luke Bugler, Liam Dow, Tim Loehner, Matt Mahoney, Colin Monahan, Josh Raposa. Xaverian: Mitch Harmon, Alex Henry, Lucas Taxter. Commonwealth — Greater Lawrence: Dylan Colon, Miguel Cumba, Jonathan Infante, Saul Ortega, Yosvaldy Tejeda. Greater Lowell: Randy Brown, Nick Byron, Josh Heyl, Tyler Labonte, Bryant Va. Minuteman: Daniel Jacobson, Drew Montague. Mystic Valley: Charif Elmoussaoui, Sean Flanagan, Patrick McPherson, Jonathan Powers. Essex Aggie: Brendon Hurley, Philip Simonton, Michael Tilton, Douglas Wilson. Northeast: Brendan Surette. Shawsheen: Marty Glynn, Coltin Urro. Dual County — Acton-Boxborough: Gabe Kline, Sam Toulin, Ben Vitale. Bedford: Samuel Bradford. Concord-Carlisle: Eli Decker, Josh Elwood, Zach Munn. Lincoln-Sudbury: Ryan Honens, Zachary Joachim, Josh Kerber, Ben MacDonald, Felix Roberge, Reilly Shew. Newton South: Michael Costello, Allen Shiu, Dylan Shuler. Waltham: Roger LaCroix. Westford: James Millet. Eastern Athletic — Bishop Feehan: Matthew Danosky, Ian Kelly, Andrew Pearl, Stephen Scala. Coyle & Cassidy: Joseph Gill, Scott McClusky, Daniel McSolla, Nick Southworth. Martha’s Vineyard: Jere Alley-Tartar. Somerset Berkley: Evan Spangler. EIL — Beaver Country Day: Murray Sklonick, George Wright. Berwick: Aidan Cookson. Concord Academy: Bryan Gallagher, Isaac Levine, Dan Mueller, Finn Pounds. Lexington Christian: Connor Meaney. Pingree: Adam Gerber, Evan Maravelis, Kyle Skelton. Greater Boston — Cambridge: Esu Alemseged, Daniel Aschale, Samuel Ingersoll, Michael Scarlett, Sam Stubbs. Malden: Daniel Gould, David Kibazo. Hockomock — Attleboro: Elliot Kelly. Franklin: Devon Strok. King Philip: Owen Gonser. Mansfield: Jack Crawford, Mike Duggan, Val Madonna-LunDucci, Dan Romano, Andrew Simons, Mike Yang. North Attleborough: Ian Flanagan, Mike Kelleher, Ted Nolan. Oliver Ames: Dan Moverman. Stoughton: Adam Sellsman. Taunton: Andrew Doherty. ISL — Brooks: Joe St. Cyr. BB&N: Zack Boughner. Governor’s Academy: Patrick Farrell, McLean Sherrin. Middlesex: Viraj Deokar, Lucas Estrada, Gavin Fujimori, Peter Howe, Miles Petrie. Milton Academy: Connor James. Nobles: Eric Jubber. Roxbury Latin: Harry Doernberg, Joey Mullen. St. Mark’s: Eric Danielson, Sean McLaughlin, Liam Monheim, Matt Thalmann. St. Paul’s: Jake Evanson, Marc Roy. Lighthouse — Cape Cod Academy: George Benway. MBIL — Boston Trinity: Duncan Smith. BU Academy: Liam Clancy. Brimmer & May: Kyle Anderson, Houghton Yonge. Cambridge Weston: Joey Boots-Ebenfield, Nick Lees. Commonwealth: Raphael Gordon. Gann Academy: Noah Bernays, Annika Gompers, David Kleinberg. Mayflower — Bishop Connolly: Brendan Sasse. Bristol-Plymouth: John Salamanca, Alex Sandoval. Diman: Mike Lavoie. Norfolk Aggie: Phillip Jewers. Sacred Heart: Chris Gren, Yanni Pappas. Upper Cape: Doug Cleary. West Bridgewater: Brian Campbell, Shane Healy, Adam Petti, Steven Savoy, Tim Spatola. Merrimack Valley — Billerica: P.J. Garmon. Chelmsford: Quinn Cooney, Max Higson. Dracut: Tim Poitras. Haverhill: Christian White. Lowell: John Abraham, Larry Carney, Matthew Fowler, Randy Nong. Methuen: Jeff Reddy. North Andover: Martin Conrad. Tewksbury: Anthony Darrigo, Joseph Darrigo, Mike Famiglietti. Middlesex — Arlington: Andrew Peterson, Gabe Putnam. Belmont: Lewis Silletto, Tim Siracusa. Burlington: Paul Hogan, Kevin O’Connor. Lexington: Ethan Isaacson, Ben Jacobson, Zack Manickas-Hill, Ben Martell. Melrose: Christian Gentile. Reading: Matt Dynan. Wakefield: Jackson Gallagher, Aaron Lucci, Chris McNall, Alex Rodgers, Patrick Scheeler. Watertown: James Garbier, Daniel Shin. Wilmington: Alex Pizette. Winchester: Jacob Zuch. Northeastern — Beverly: Campbell Woods. Gloucester: Everest Crawford. Marblehead: AJ Ernst, Chris Rodts. Peabody: Ben Braz, Drew Fossa, Marcelo Rocha. Swampscott: Matthew Mahoney. Patriot — Duxbury: Tate Allen, Craig Feeney, Kevin O’Rourke. Hingham: Sam Mildrum, Alex Riddell, Greg Williamson. North Quincy: Mike Mullaney. Pembroke: Tom Hoare, Joe Lagner, Korey Leonard, John McMahon, Isiah Savage, Christian Stafford, John Valeri. Scituate: Jake Reynolds. Silver Lake: Tyler Stafford. Whitman-Hanson: Pat Brett, Tyler Durant, Sam Evans, Brian Sheppard. South Coast — Bourne: John McWade. Dighton-Rehoboth: Ty Enos, Kyle Fendon, Alden Foelsche. Greater New Bedford: Zack Viera. Old Rochester: Michael Kassabian, Mike Wyman. Seekonk: Nick Accardi, Andrew Feigherty, Alex Lanzi, Brendan Pickett, Tim Salit. South Shore — Abington: Nick Sideropolous. Carver: Sam Estes. East Bridgewater: Nick Frazier, Brett Jutras. Cohasset: Julien Geyer. Monomoy: Matt Hall, Ryan Richer, David Sherman, Troy Sherman. Norwell: Max Abbott, Chris Fairfield, Tommy Hynes, Andrew Infascelli, Ed Masterson, Ethan Wu. Rockland: Owen Scott, Ian Welch. Tri-Valley — Bellingham: Dan Schmith. Dover-Sherborn: Trevor Chistolini. Medfield: Andrew Robartes, Ian Robertson, Sean Robertson, Austin Scola. Norton: Billy Sullivan. Westwood: James Terzian.